Neuroimaging study maps brain neurotransmission system involved in obesity. Researchers at Aalto University and University of Turku have revealed how obesity is associated with altered opioid neurotransmission in the brain. New research reveals how obesity is associated with altered functioning of brain’s opioid system, which is intimately involved in generating pleasurable sensations. 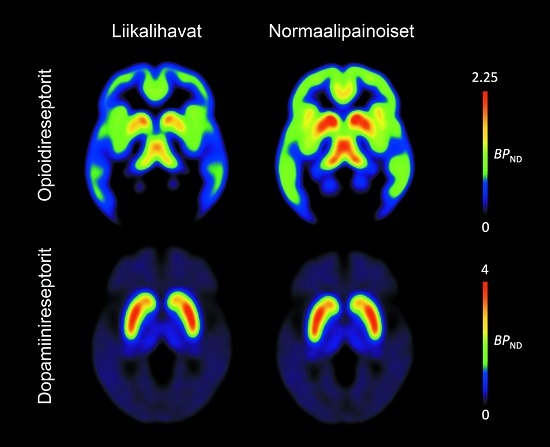 The researchers measured availability of mu-opioid and type 2 dopamine receptors in normal-weight and obese individuals’ brains using positron emission tomography at the Turku PET Centre. The study is published in The Journal of Neuroscience. The team found that obesity was associated with significantly lowered number of opioid receptors in the brain. However, no changes were observed in the dopamine neurotransmitter system, which regulates motivational aspects of eating. The team state that the findings highlight how obesity is associated with brain-level molecular changes. It is possible that the lack of brain’s opioid receptors predisposes obese individuals to overeating to compensate decreased hedonic responses in this system. The researchers explain that the findings have major implications for understanding of the causes of obesity. They help to understand the mechanisms involved in overeating, and provide new insight into behavioural and pharmacological treatment and prevention of obesity. However, the group stress that they do not yet know whether the altered brain neurochemistry is a cause or consequence of obesity. Obesity is associated with lowered opioid receptor availability (top row) whereas availability of dopamine receptors remains unchanged. Brains in the left column belong to obese people and brains in the right column to normal-weight people. Credit: Aalto University.